2 Winter 2015 psf.ca CO-EDITORS Michael Meneer Elayne Sun EDITORIAL COORDINATOR Matt Currie ART DIRECTOR Laurel MacLean CONTRIBUTING WRITER Stephen Bruyneel ELECTRONIC IMAGING Mandy Lau PRODUCTION COORDINATOR and PRINT PRODUCTION MANAGER Kristina Borys Salmon Steward is published for The Pacic Salmon Foundation by Canada Wide Media Limited. 230, 4321 Still Creek Drive Burnaby, British Columbia Canada V5C 6S7 Telephone: 604.299.7311 canadawide.com No part of this magazine may be reproduced without written permission of the publisher. Pacic Salmon Foundation 300 – 1682 West 7th Avenue, Vancouver, B.C. V6J 4S6 T: 604.664.7664 | F: 604.664.7665 support@psf.ca | www.psf.ca Canadian Publications Mail Product Sales Agreement No. 40065475 Printed on FSC ® certied paper. 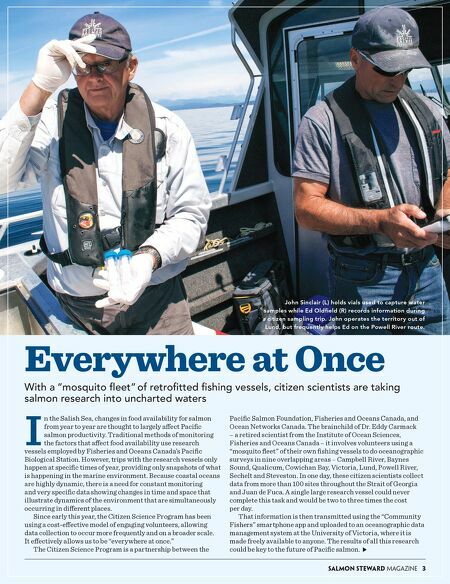 On the cover: Citizen scientist and shing guide, Billy McMillan, gathers data in the Strait of Georgia. Photo: Ron Sombilon www.psf.ca | Winter 2015 Magazine Who Are We? The Pacific Salmon Foundation was established in 1987 as an independent, non-governmental, charitable organization to protect, conserve and restore wild Pacic salmon populations in British Columbia and the Yukon. Today, the Foundation galvanizes the breadth of vested stakeholders to support Pacic salmon from stream to estuary to ocean. The Foundation: • Raises money and makes grants to volunteer community groups that conserve and restore streams across the province. • Manages watershed initiatives in British Columbia that catalyze industry, First Nations, provincial and federal governments, and other non-prots. • Advances science to improve the understanding of factors that limit the abundance of Pacic salmon. • Works with government to prioritize and facilitate strategic salmon conservation in the province. 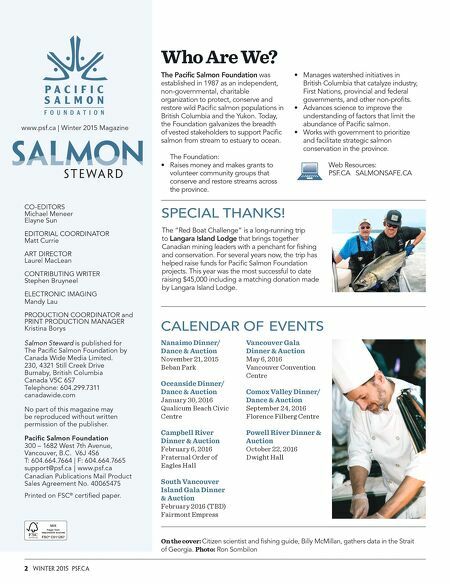 Web Resources: PSF.CA SALMONSAFE.CA Nanaimo Dinner/ Dance & Auction November 21, 2015 Beban Park Oceanside Dinner/ Dance & Auction January 30, 2016 Qualicum Beach Civic Centre Campbell River Dinner & Auction February 6, 2016 Fraternal Order of Eagles Hall South Vancouver Island Gala Dinner & Auction February 2016 (TBD) Fairmont Empress Vancouver Gala Dinner & Auction May 6, 2016 Vancouver Convention Centre Comox Valley Dinner/ Dance & Auction September 24, 2016 Florence Filberg Centre Powell River Dinner & Auction October 22, 2016 Dwight Hall CALENDAR OF EVENTS The "Red Boat Challenge" is a long-running trip to Langara Island Lodge that brings together Canadian mining leaders with a penchant for shing and conservation. For several years now, the trip has helped raise funds for Pacic Salmon Foundation projects. This year was the most successful to date raising $45,000 including a matching donation made by Langara Island Lodge. SPECIAL THANKS!